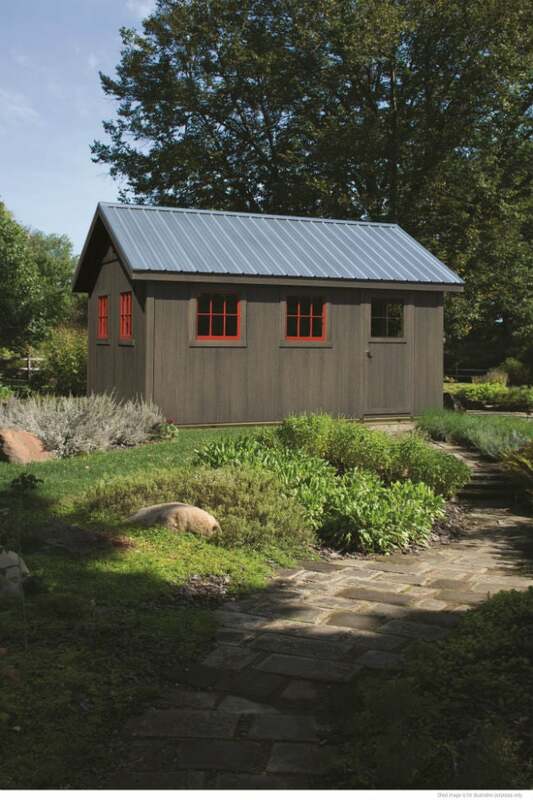 You certainly want your shed—and everything in it—to weather plenty of seasons. Well, if durability's your goal, choosing the right materials and design can make all the difference. Read on to learn about the durable products and building practices that create the most resilient backyard sheds. Homeowners typically use sheds to stash stuff—everything from off-season sporting equipment and unused furniture to appliances and power tools. Some even convert their sheds into gardening centers or playhouses. But, no matter how you intend to use your shed, you’ll get the best return on your investment if you build it to last. By incorporating these sound building techniques and reliable products from LP® Outdoor Building Solutions®, the proven leader in high-performance building products, you can create a shed that will stand strong for years to come. Whether you choose to build your own shed, hire a contractor to build one, or buy a prebuilt shed, the first thing you’ll have to determine is what type of foundation you’ll need to support it. Start by checking with your local building and zoning departments and your local homeowner association: You may need a permit and there may be regulations governing the foundation setback from your property line. Some communities require that a shed be placed on a poured concrete slab; others may allow you to position your shed on a base of gravel, as long as the shed base is higher than the surrounding ground and water will drain away from the shed. Even if local building code does not require a specific type of foundation, the last thing you want to do is just set your shed on the ground. Direct contact with damp soil may eventually lead to rot, depending on the materials you’ve used. 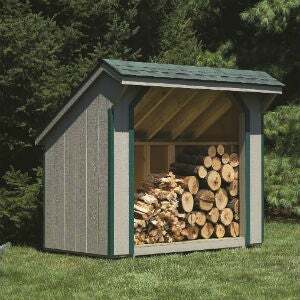 Before you begin work, ask your shed dealer about the recommended foundation, which could be as simple as crushed gravel or 4×4 treated beams every four feet on center that raise the bottom of the shed above a ground cover vapor retarder to reduce the risk of moisture damage. It’s also imperative that the shed foundation be perfectly level. This ensures, among other things, that you’ll be able to open the door without trouble. Outdoor structures are often prone to insect infestation, but you can reduce the risk of damage by building with reliable materials. For example, LP® ProStruct® Flooring resists warping as well as damage from termites. Manufactured with LP’s SmartGuard® technology, the engineered wood flooring is treated with zinc borate (a wood preservative) and a proprietary blend of resins and waxes that enhances durability and protects the material. This combination gives ProStruct Flooring a step up over untreated plywood flooring, and its overlay is an attractive bonus! During construction, or even if you’re putting in a pre-built shed, it’s also a good idea to seal all cracks or crevices with caulk to prevent unwanted critters from gaining access to the inside of your shed. Your shed’s roof plays an important part in protecting its contents from damage, so don’t skimp on design or materials here! For starters, keep in mind that the slope of the shed roof directs how and where water runs off. Some shingle manufacturers will not warranty their shingles if they’re installed on a roof with less than a 4:12 pitch, which just means that the slope of the roof drops four inches for every 12 inches it extends outward from the ridge. The steeper the slope, the more quickly water will drain off. Not only do shed roofs channel rainwater, they also take a beating from the harsh rays of the sun. Because outdoor sheds typically are neither insulated nor climate-controlled like residential houses are, they’re subject to wild temperature fluctuations that can rapidly transform the interior of a standard shed into a sweltering sauna. As heat and humidity are known enemies of wood, those temperature swings can wreak havoc on stored furniture or your shed’s interior framing members. Help protect your shed and its contents by installing LP® ProStruct® Roof Sheathing with SilverTech® over the roof framing. 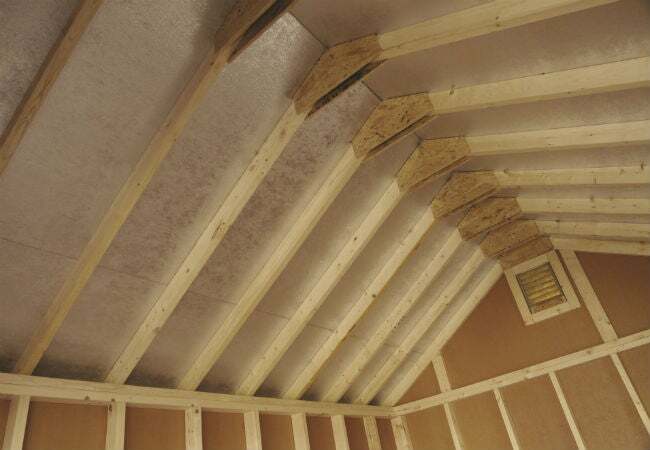 While LP ProStruct Roof Sheathing installs like any other sheathing, it features a metallic radiant barrier that reduces heat transfer from the shingled roof to the inside of the shed. To diminish heat transfer through walls, consider including LP® SmartSide® Panels with SilverTech® as well as radiant heat-reducing roof sheathing. This combination of panels will not only help your stored items stay cooler, but the highly reflective interior surface can also make the shed interior seem brighter. This content has been brought to you by LP Building Products. Its facts and opinions are those of BobVila.com.